I have fond memories of ice skating as a child. When the creek behind our house and the nearby lakes froze over in the winter we would lace up our ice skates and hit the ice. We would skate until we were so cold that our noses were red and our toes and fingers were numb. When we got back to the house mom always greeted us with a mug of hot cooca. I tried ice skating again with my children when they were little…and I failed miserably. It seemed so effortless when I was young! LOL 🙂 I still have my last pair of white ice skates hanging in the garage, although it has probably been over 40 years since I have worn them. I stamped the images with Copic friendly Gina K Designs Amalgam Black Ink onto #80 Neenah cardstock. When I looked at the little girl, in the Seasonal Sweetheart Stamp Set, I thought that her boots looked like ice skates. It didn’t take long before I pulled out a pencil and drew some laces and added some blades. I went over my pencil lines with a black 0.2 Copic Multiliner. 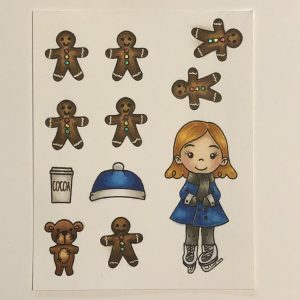 I had originally planned to use this image before the holidays so I had stamped and colored a plethora of gingerbread people. They have been die cut and will be used another time. Because I had drawn on the skate blades it was necessary to fussy cut the image. I used the coordinating Seasonal Sweetheart Dies for the other images. I know that many of you like to have the Copic Marker colors, so I will include them. 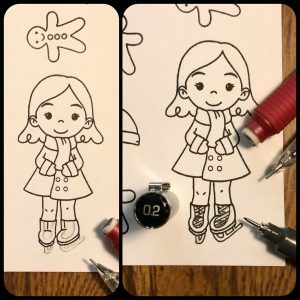 The blades on the skates were colored using a silver Uniball Signo Glitter Pen. Her eyes and nose were darkened with a Black Gelly Pen. To create the background, I cut a piece of silver glitter paper from The Paper Studio Pastel Glam Solids Cardstock pack, that I found in Hobby Lobby. The Honey Bee Deckle Edge A2 Dies leave a pretty edge. I also cut a small piece of the light blue glitter cardstock and used the dies along the sides and bottom. I cut a piece of #80 white Neenah using the largest die. 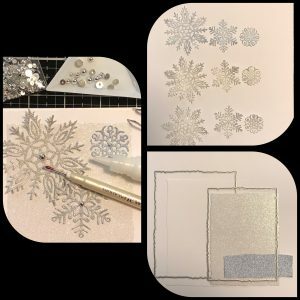 I cut snowflakes from various colors of the same cardstock, using the Alicia, Rina, and Kadyn Snowflake Dies from Simon Says Stamp. 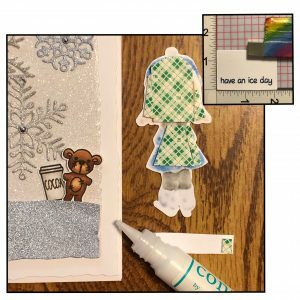 I glued the panels together and added the snowflakes to the card front using Gina K Connect glue. I left the edges of the largest flake unglued to give some dimension and movement to the card. Trinity Stunning Silver Baubles were added to the centers of each snowflake. 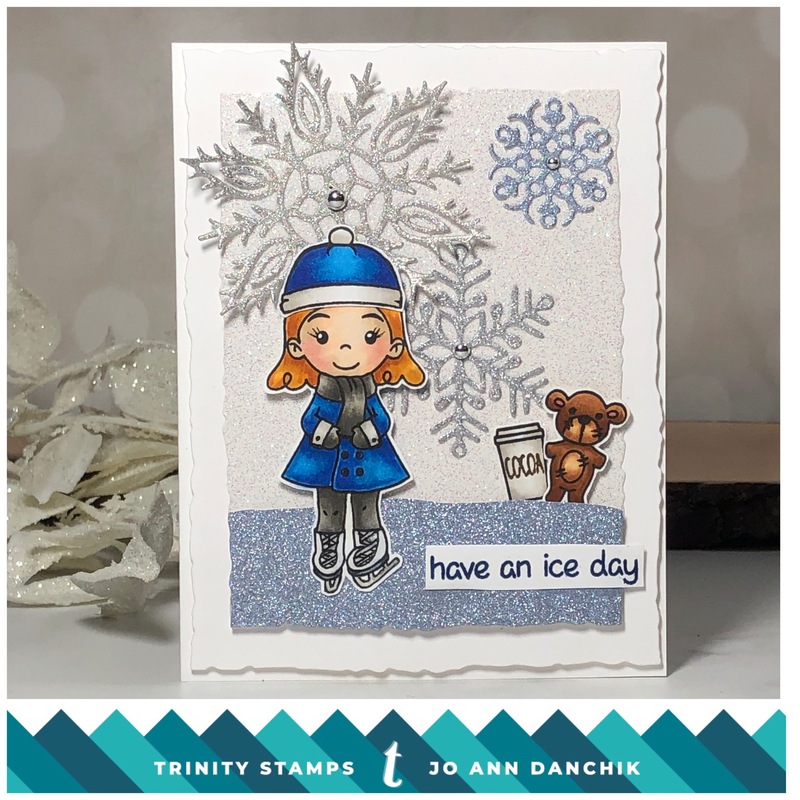 The sentiment is from the Lawn Fawn Critters in the Arctic Stamp Set and was stamped with Ranger Archival Cobalt Ink. Sometimes it just takes a village to come up with all the various elements needed to pull a fun card together! The girl was attached with Scotch Foam Tape for some added dimension. I sometimes find that it is hard to tape things to glitter paper so I add a little wet glue to the foam tape for added security. It is so hard to photograph the sparkle and glimmer of this card, but it truly shines! And how cute are the little teddy and the hot cocoa waiting for her on the edge of the lake? As always, thanks for joining me today. I look forward to creating with you again here at Trinity! You can also find me on Instagram at jadanchik or on my blog at jadanchik.com for more product detail. So stinkin cute Jo Ann!